A few years ago I went to a mead tasting over Christmas vacation in San Diego, which is 6 hours from Phoenix. Fortuitously, I was using my travel time to work on my New Year’s Resolutions. And guess what one of my resolutions was…? Yep, to learn how to make mead. So I did lots of research in that same time to find out how to make it and where I could get equipment cheap, because that’s kind of how I am…Cheap! Well, I found some stuff on Craigslist and some at Goodwill, and then I “accidentally” came across the Brew Your Own Brew store as I was coming out of a post office I usually don’t use. Since all the stars seemed to be aligning for me to make mead, I jumped on in. Then I realized how much honey it takes to make mead, and as you know, I’m cheap. So it just made sense that I should find a way to get me some bees to make honey for me. And that’s how I became a beekeeper! It was April when I finally made this decision and found a hive box on Craigslist, so it was a little late to order bees. I called the local beekeeping club and they connected me to Roy who promised to get me some bees. And he did! A huge swarm that he captured was now mine. I was instantly hooked and I made sure to learn everything I could from Roy. We did bee relocations that took 6 hours. We removed super aggressive hives to the desert to requeen. I absorbed everything Roy told me, and we built a wonderful friendship. I understood how valuable that relationship was, and how none of the beekeepers I met had that. So in February of that year I decided that we needed a better network for Arizona Backyard Beekeepers and I started our Facebook page. My hope was to connect local beekeepers and build a community where any question could be asked and help would be available at every moment. Beekeeping alone isn’t fun when you have a hive with problems and nobody to help you. 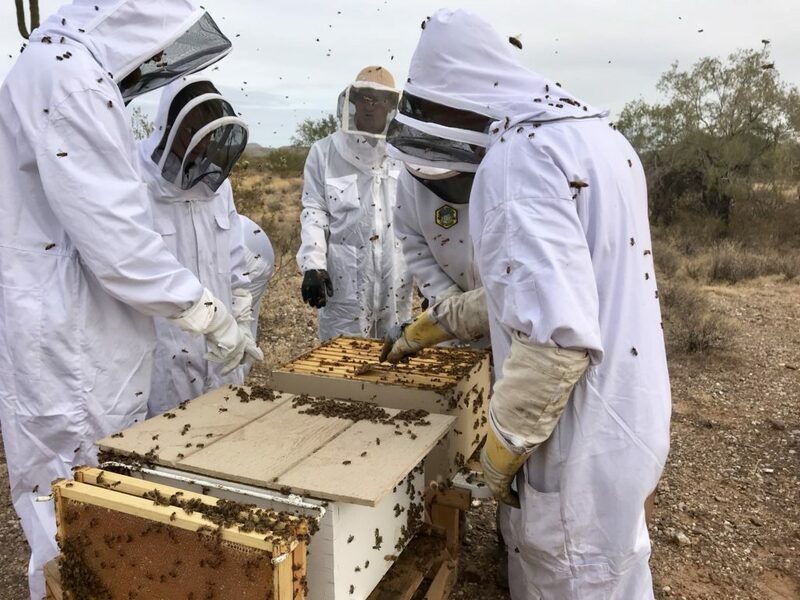 Arizona beekeeping is different than beekeeping in other areas of the country. Our climate and the prevalence of Africanized bees is a complete game changer that beekeeping in general doesn’t address. 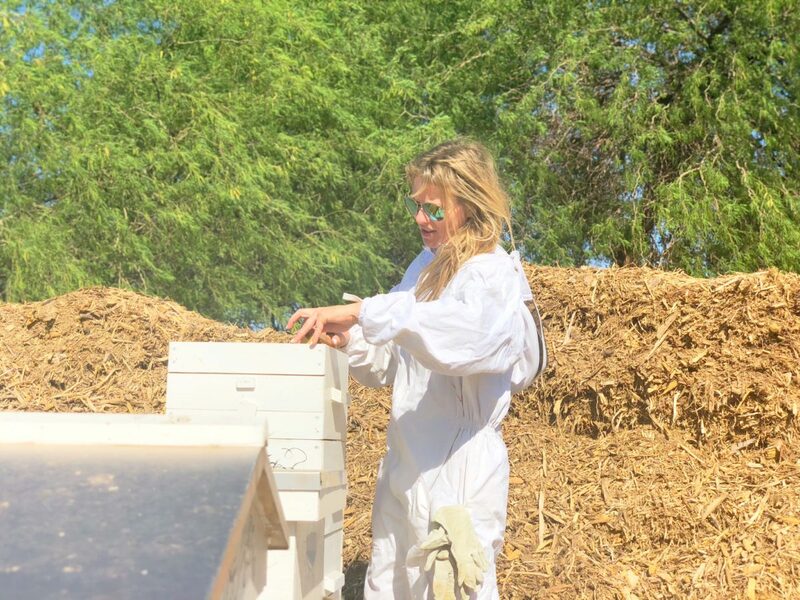 I am so proud of Arizona Backyard Beekeepers! We are a group of positive bee-lovers who are always looking out for each other. Together we have promoted live bee removals as opposed to extermination, we have connected with exterminators who refer bee jobs to us, and we have increased the number of backyard beehives in the Valley. Nearly all of us promote re-queening of Africanized hives, and make it a mission to improve the number of docile hives to add to the genetic pool of drones. I could go on and on about this, but why don’t you just join us and see for yourself? I love Arizona Bees! I love helping and encouraging Arizona Beekeepers! And I love sharing it all with anyone who asks!